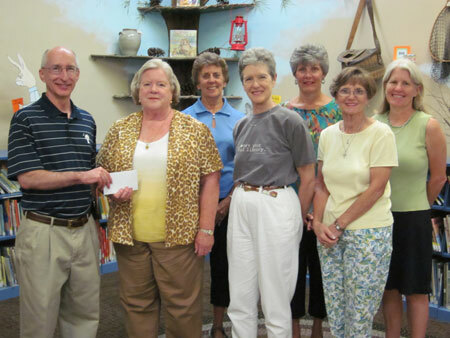 Edgefield County Council Chairman Dean Campbell, left, presents a personal donation to the Library Project to the Friends of the Edgefield County Library, to help start the donation as part of this year’s Chairman’s Community Project. Accepting the donation is Ann Day, Friends President, with other Friends members, from left, Cynthia Bull, Laurel Blossom, Patricia Bryan (also Edgefield County Library Board Member), Elaine Parker, and Mary Jo Dawson, ABBE Regional Library Director. The fundraising Project runs throughout the month of September. Edgefield County Council Chairman Dean Campbell is kicking off this year’s Chairman’s Community Project to bring more books and supplies to the three Edgefield County libraries. Libraries are an integral part of every community, Campbell said, adding that in today’s electronically-connected world, libraries still play a key role for young and old. In the three Edgefield County libraries, located in the towns of Trenton, Johnston and Edgefield, patrons continue to check out books, participate in programs and use computers at an all-time high, based on patron visits and what they use the library for. The funds raised through the Chairman’s Community Project, which come only from public donaitons, will be divided among the three County libraries, unless the donor designates a specific library for his or her donation. Funds raised through this program will be primarily used to purchase additional children’s and teen’s books, as well as programming supplies used by the children, such as paper and craft materials. The local libraries are part of the Aiken-Bamberg-Barnwell-Edgefield (ABBE) Regional Library System. Mary Jo Dawson, ABBE Regional Library Director, said the local libraries can always use “discretionary” funds, such as these, to continue to ensure the Edgefield County Library System stays current with materials. While some state and county money goes into the local libraries, those funds are enough to fund salaries, utilities, office supplies, mobile libraries, and other administrative costs. Only a small amount is left to purchase books and materials. But the local library system continues to respond to citizen needs, Mrs. Dawson said. For example, the libraries just completed the first year of offering downloadable ebooks and audio books through the ABBE website. Mrs. Dawson added that the free internet service at the libraries helps those citizens without computers in their homes to compete for jobs, keep current with information, and generally level the playing field for them in a growing electronic/internet-driven world. Campbell began the Chairman’s Community Project as an annual fundraising effort to help fill a need in the area. Past years’ Projects have included raising money for heating bills for those who couldn’t afford it to providing more funds and food for the Johnston Food Bank. For those who want to contribute to this year’s fundraising Project, monetary donations, which are tax deductible, should be mailed to the Friends of the Edgefield County Library, 105 Court House Square, Edgefield, SC 29824. For more information about the Edgefield County libraries, contact Lisa Lintner, Edgefield County Public Library Manager at 803-637-4025. The Project runs during the month of September.